* Changes time and pitch independently. * Can freeze time and run backwards at any speed. * Formant changing and locking. * Runs to 192Khz. With any input sample. * Stream output to WAV file. * A-B mixing for voice and other effects. * This is NOT A PLUG-IN, it is stand alone software. 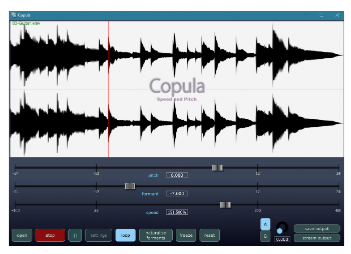 Copula is a deceptively simple software that separates time from pitch in audio samples. Time can be stetched from 25% to 400% and pitch by two octaves up and down. Time can also be frozen by a click of a button. 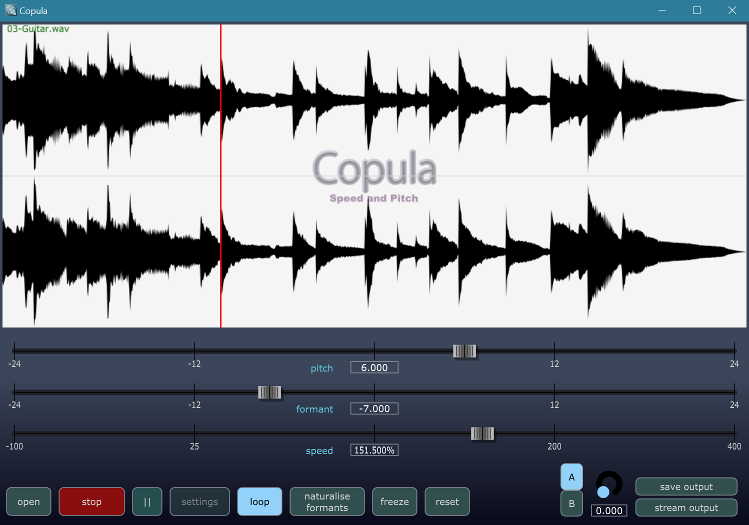 The registered version can also stream out audio as a wav file, live at the audio device's sample rate. Allowing to save your time and pitch alterations. Time varying audio demo. Speeds up slowly, then up to 400%, then back down to time frozen. Then reverse, and then back to normal. Percussion, Pitch and speed audio demo. Demonstrates the high accuracy of the sharp hits no matter what speed or pitch. Extreme slow speeds, and vocal freeze. Speech pitch and then formant preserving.